Flip through and see what Robby drew. Here is his neighborhood: green rectangles for lawns, squares topped with triangles for houses. Here is Paris, France. The Eiffel Tower rendered as a capital A. A furious scribble (we went here the Louvre museum). An arrow proudly points the way to our Hotel! Here is the Way to Witches Land. A thick, serpentine road. Beside a hairpin turn, Robbie has drawn a crossed-out car with a warning: witches want you to crash. After a forest of lollypop trees, another warning: No Trail Going to get lost. The boy has also drawn maps for New York, Nevada, Alaska. 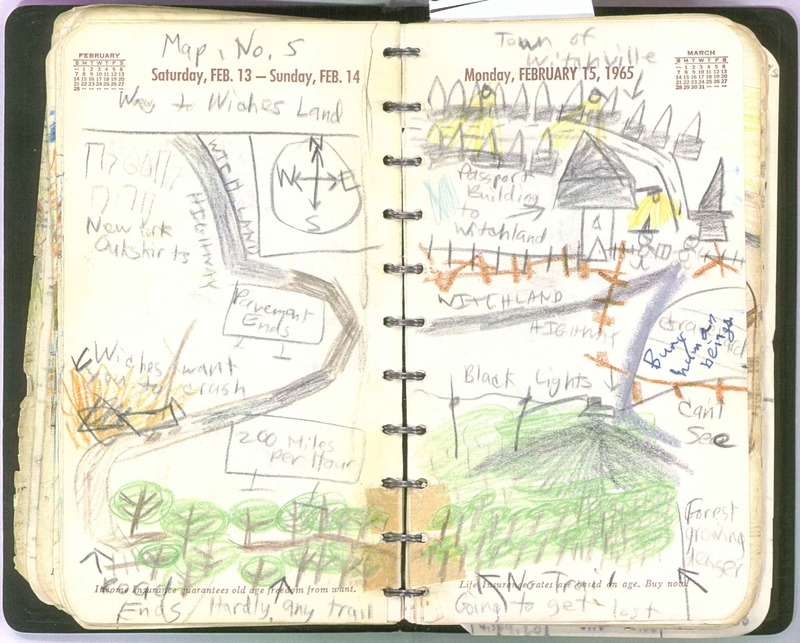 You come to the map he calls Robert’s Land on Thursday, June 24, 1965. There, a star inscribed in a circle indicates Robertville, the town capital. But every page is his geography. Robby Schwarz sits at the third desk in row 7, the last row. To his right is Susan C. (Susan H. sits in front of her). There are two blackboards and a wardrobe. The teacher is a stick figure with no mouth and three little loops for hair. Robby will have five classroom jobs in 1965: Leader, Wardrobe Monitor, Book Monitor, Out of the Room Monitor and TV Monitor. Underneath his classroom sketch is a typeset message from Leroi, Flesch & Co: Life Insurance rates are based on age. Buy now! 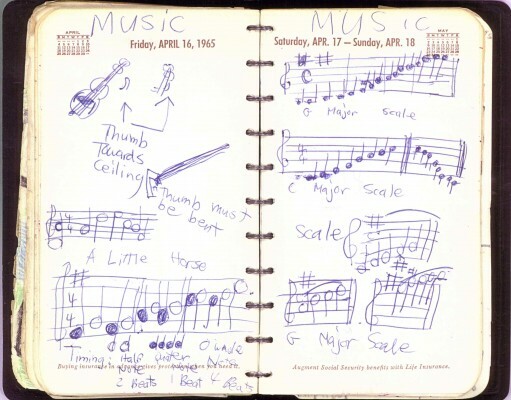 When school is almost out, on Sunday, May 16, 1965, Robby Schwarz will see the Twenty-Fourth Spring Concert at Queens College. He will copy into his diary the program: Berlioz Op. 2. Joseph Surace, Organ. Carl Eberl, Conductor. Polynesian Dances. Intermission. This year Robby will take violin lessons. He will learn all the musical notes. He will remember, when holding the instrument, to keep his thumb bent. But enough predictions about what will be. 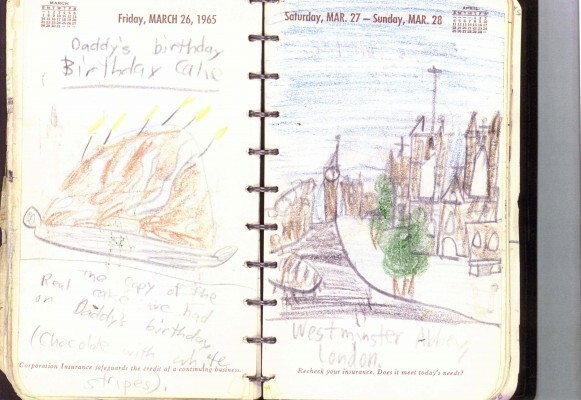 Flip through the diary backwards and you are in the past again: Robby has been to Trafalgar Square, Westminster Abbey, the Houses of Parliament. To Niagara Falls. To a Snowy Park Monument in Colorado. To Lhasa, Tibet, and Davos, Switzerland. Robby has also explored interior landscapes, illustrating the circuitry in his radio, the steering coils in his television set. Ah, the jittery itch of precocity! The insatiability of privilege, wild leapings from one page to the next! You imagine him traveling the world with his parents. You imagine him in hotel rooms, lonely, drawing in his diary. Close the diary. Listen closer now. Can you hear his mother? Our beloved President Robert Schwarz Sr. died today at the age of 43 because of a heart attack. The doctors said it was a heart attack from strain. Our newly elected president will be Robert Schwarz Jr. The creepiness is not lost on you. Did Robbie’s father die on July 16, 1965? Or was Robbie committing an act of imaginary patricide? So you flip through this boy’s diary one last time to get the whole scope of it, to take one last look at this Spanish-speaking, violin-playing, eight-year-old globe-trotter. Memories as they are recalled, histories as they are written, have a way of leaving things out, after all. Always, there is wishing and there is memory, but it is difficult to tell the difference. Rebecca Donner is the author of the novel Sunset Terrace and the graphic novel Burnout, a collaboration with the artist Inaki Miranda. She has published essays and criticism in the New York Times, Bookforum, and The Believer, and was a lyricist at New York’s Symphony Space from 2007-2010. Recently, she was awarded a residency at Yaddo.